Upcountry Maui generally refers to the area of land located on the north central slope of Haleakala. Kula is considered the "heart" of Upcountry. The climate here is cooler, with mists swirling in the valleys and groves of eucalyptus sheltering pastures full of cattle. 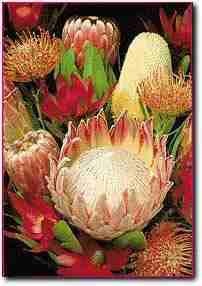 Here the exotic Protea grows on the slopes of Haleakala - an unusal flower that blooms in a rainbow of colors and forms. Several farms grow acres of the many different varieties that are shipped all over the world. Upcountry has fantastic views, a panorama of distant Puu Kukui, the extinct volcano of West Maui, the Valley, and the Pacific on both coasts. The Tedeschi Winery in Ulupalukua is Hawaii's only vineyard. Stop and taste the Tedeschi products at the historic little stone tasting room, which was once a jail. The immaculate grounds, landscaped with 100-year-old trees, are a great place for a loaf of bread, a bottle of wine and a designated driver! Haleakala is an active, but not currently erupting, volcano that last released its fury in 1790. Over 200 years later the land surrounding the lava flow is still barren. The summit rises 10,023 feet above sea level. The crater is 3,000 feet deep, 7.5 miles long and 2.5 miles wide with a total circumference of 22 miles. One of the world's most spectacular views is from the Haleakala summit. All of Maui is at your feet. The drive through upcountry Maui to Haleakala is one of the most dramatic trips of a lifetime. 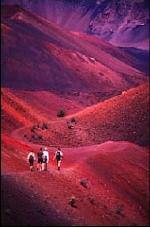 Visitors can see Haleakala on foot, bicycle, horseback, motorcycle, or car. There are numerous guided hikes and tours offered by the National Park Service and by private activity companies. Visiting the crater at sunrise or sunset is a most memorable experience.